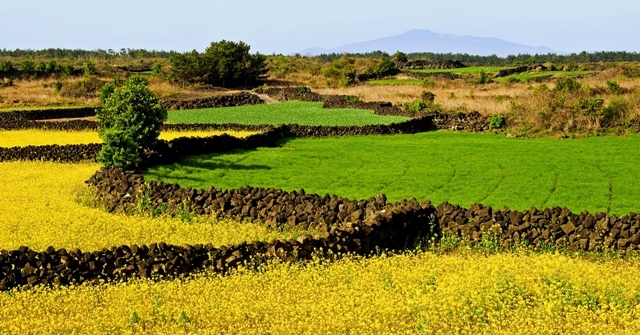 Visitors can often see the full glory of Jeju’s stone-wall landscape when flying into the island from the mainland. As the plane banks, a patchwork of mandarin, canola, broccoli and carrot fields are demarcated below by black basalt stone walls which criss-cross the land for 22,000km. Researcher and local teacher Dr Kang Seong-gi says that these “batdam” stone walls, known as ‘The 4,000km Black Dragon,” etch history and culture into the local landscape. Jeju’s batdam culture grew out of necessity as only 23 percent of local soil is non-volcanic and the rest is strewn with basalt rock. Most arable land contains up to 40 percent loose rock (known as “jakjiwat”), while the remainder has shallow or exposed bedrock (known as “billewat”). Farmers pile the loose rocks into “meodeul” and large rocks are added to batdam stone walls. The batdam has ecological value as it helps prevent soil erosion, retain water, and function as a windbreak. The holes between the basalt rocks also enable air to pass through, allowing them to withstand Jeju’s strong winds. Even today, says Dr. Kang, the windbreak function of the walls is seen in their varying height across the island. In coastal regions they tend to be higher while inland the height varies with crop type. Mandarin orchards, for example, tend to have taller batdam to protect the trees. Records show construction of stone walls expanded during the 13th century as foraging Mongol horses during the Yuan occupation (1276 and 1374) forced farmers to protect crops. Later in the 1960s, the stone walls slowed down the New Village Movement’s mechanization of agriculture. Nevertheless, says Dr. Kang, much has been lost in recent decades due to mechanization, urbanization and changing field boundaries. The use of alternative windbreaks and greenhouses for crops means that much of Jeju’s batdam has fallen into disuse, and the state of disrepair is exacerbated by an aging farming population. Belatedly recognizing the threat, Jeju’s batdam were inscribed as National Agriculture and Fisheries Heritage Systems in 2013. A year later, they were added to the UN Food and Agriculture Organization’s (FAO) Globally Important Agricultural Heritage Systems (GIAHS) alongside the Aohan Dryland Farming System in China, the Saffron Heritage of Kashmir, India, and Traditional Reindeer Herding in Siberian Russia. There could also be room for optimism as the stone wall’s ecological and cultural values are prized by the recent influx of younger farmers using environmentally friendly farming methods. Nevertheless, sections of wall are crumbling daily, and the figurative 4,000km of the ‘Black Dragon’ could soon be starkly accurate. Another aspect of Jeju’s stone wall heritage is tucked away in the Jungsangan mid-mountain interior. Dr. Kang Man-ik, a local high school teacher and geographer, can often be found here trudging across high mountain fields with ancient maps in pursuit of what little remains of Jeju’s “jatseong” stone walls. The jatseong is the last vestige of Jeju’s famous 15th century Joseon horse pastures which were famed across East Asia. Jatseong stone walls are fortress-like, being double-layered and reaching heights of up to 2 meters. Rather than keeping livestock away from precious crops, they were intended to keep prized horses penned in. Jeju traces much of its rich horse culture back to the Goryeo era (918-1392) and particularly the Yuan occupation when Jeju was a horse-rearing hub and military garrison for the Mongols. The Mongols followed tradition when rearing horses, but Dr. Kang says that by the 15th century many locals (and many Mongol descendants) had forgotten the habits of the steppe and were merely letting the animals loose on the mountain to graze. This was a problem because the Chinese Ming dynasty was demanding an annual tribute of Jeju horses, a hardy breed of mixed Mongol Ferghana and local stock. With such pasture mismanagement, the local governor could not meet the quota. Ko Deok-jong, a Jeju man, saw that effective and centralized management was essential. He requested that King Sejong (r. 1418–1450) establish a state-run pasture on the island, which began with the construction of the first jatseong walls in 1430. It should be noted, says Dr. Kang, that the construction of the jatseong was not necessarily good news for locals. The walls were built on the blood and sweat of villagers who transported large rocks over long distances on their backs. The first stage was the “hajatseong” (lower jatseong) completed in 1430 at 150~250 meters to keep animals away from crops. This was followed by the upper “sangjatseong” at 450-550 meters in 1780 to keep horses secure and safe during high-altitude summer grazing. The mid-jatseong (“jungjatseong”) at 250-450 meters was built as recently as the 19th century as the pasture area was reduced and divided. Dr. Kang sees it as his personal mission to spread the values of the jatseong worldwide, and he is attempting to establish an international network of grassland cultures to help fight desertification and food shortages, all inspired by Jeju’s jatseong. Such a mission is important, but Jeju’s own stone wall heritage is far from secure. Despite GIAHS inscription, batdam is without legal protection and only around 1.2km of the jatseong, yet to be designated as cultural heritage, remains mainly in Gasi-ri, southeast Jeju. Sadly, the ubiquitous black rock that has defined the island for centuries is becoming scarcer in Jeju’s new urban districts, and there are few preservation efforts in the vast swaths of the island earmarked for development. Enthusiasts such as Dr. Kang Man-ik and Dr. Kang Seong Gi are doing their best to ensure that the batdam and jatseong remain part of the living heritage of the island, before the Black Dragon is forever slain.